Call 1-800-560-2242 for immediate assistance or fill out the form below. Since 1991, Advantage Business Equipment has been providing the lowest prices and professional customer service to 1000’s of customers worldwide. We GUARANTEE the lowest price and will match any competitor’s price on new and similar items. We will respond within 15 min. Destroyit 2604 Cross Cut office shredder. & One case of 100 shred bags. 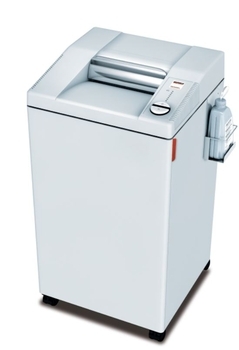 The DESTROYIT Model 2604 is a very cost-effective way to shred your sensitive documents. MBM is the innovator in safety by adding it's patented comprehensive safety package to each shredder: This includes the easy switch control element which uses illuminated colors and symbols to indicate operational status. It also serves as an emergency stop switch. Also included is the patented, electronically controlled, transparent safety shield in the feed opening to stop the unit in the event of an emergency. All units also automatically cut-off power when the cabinet is opened or shred bin is full. Features an automatic reverse and power cut-off when overfed and also has double protection against overheating to protect your investment. Zero Energy Consumption sleep mode cuts off the power supply after 30 minutes of inactivity to save power. Excellent value shredder in a cross-cut with a 1 horsepower motor. Shred size, 3/16 x 1 1/2 cut 20 to 22 sheets capacity. Shred Size (in. ): 3/16 x 1 1/2"